Over the past couple of weeks, we have seen clear evidence that the Council intends to ram through the proposed revisions to the CAOs come hell or high water (I wonder if those are critical areas too?). Two months is what we are told. Nothing will get in the way -- not the Charter, not public sentiment, not facts, not the law ... nothing. The schedule has become all important for hortator Patty Miller. Reportedly, Councillor Miller and others believe the CAO deliberations (rather than the proposed CAOs themselves) have become a virus for the community. Their top priority is getting the CAO deliberations behind us. To that end, the Council will have their first touch of the Fish and Wildlife CAO (FWHCAO) before the Planning Commission has completed their deliberations. The Planning Commission is expected to continue its deliberations about the FWHCAO on July 10, but Councillor Miller has scheduled the Council's first touch of the FWHCAO scheduled for July 9. At this rate, I wonder if the Council will pass the CAOs before the Planning Commission does? I am unaware of any other instance where the Council has taken up deliberations about a proposed land use law before having Planning Commission input. It is simply an outrageous violation of normal procedure. And it follows an earlier bizarre joint Planning Commission/County Council meeting on May 18 where the Council, and Councillor Miller specifically, dominated the Planning Commission proceedings. The May 18 meeting was billed as a Planning Commission meeting with the Council in attendance, but Councillor Miller took charge as if it were the other way around. She didn't just run the meeting, she ran over everyone in the meeting in her haste and desperation to keep things moving forward. The latest information from a meeting in Friday Harbor today, sources tell us, is that Councillor Howie Rosenfeld informed gubernatorial candidate and current Attorney General Rob McKenna that our CAOs will be passed "in a couple of months by at least a 5 to 1 margin." Did you hear that? It's in the bag. It's so much in the bag that they even know the vote before the vote. It's so much in the bag that they know the timetable for the vote before the vote. It's so much in the bag, that they are able to publicly and casually admit that it's in the bag to the sitting Attorney General. They know and say all this before they've even seen all the CAOs. It's more than battle speed at this point. They've ramped up to ramming speed, and they've dropped all pretense of impartiality. 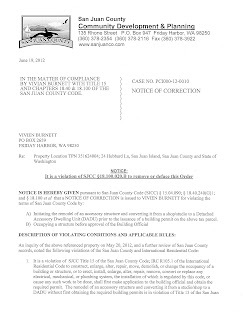 By now, word is out about Vivien Burnett. She is the Board member of the Friends of the San Juans who was caught by CDPD having an illegal guesthouse on her property. Like nearly everyone associated with the Friends, Vivien has been very outspoken against "development." The main thing I want to say is that we wouldn't be here if Mr. Dalton and his partners had followed the rule of law. We all have to follow the rule of law, and if he did that in the beginning, we wouldn't even be having this conversation. It's up to you ... when you see a violation of environmental regulations of the County and as a lover of the environment to assume your citizenship responsibilities and communicate that to the County and follow it up. Friends staff and board routinely receive complaint calls about potential code violations. Once contacted, Friends helps concerned citizens determine the appropriate next steps and often notify the County and other permitting agencies like the Department of Ecology, Fish and Wildlife, or the Army Corp of Engineers. San Juan County Community Development and Planning Department and the Prosecuting Attorney’s Office are working on a ticketing ordinance for land use violations. The goal of the ordinance is to prevent violations, and recover the cost of enforcement when action is necessary. Penalties are seen as one of the most effective prevention tools. But I think there is an angle to this story that isn't quite captured by the mere fact that Vivien Burnet said one thing and did another. 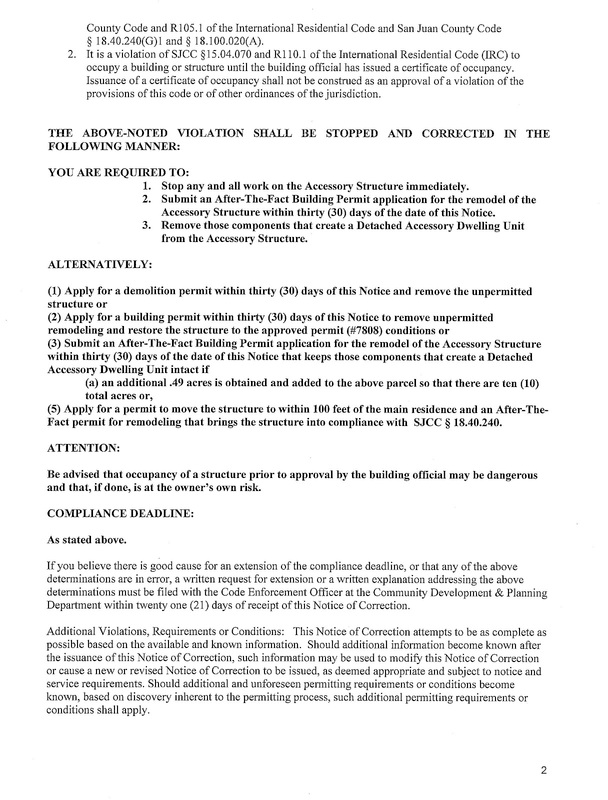 From about 1999 until 2006, the CAO-like controversy of the day was the unfolding ADU/guesthouse fiasco. The Friends led the fight against guesthouses, apoplectically shooting down opposition with withering eco-sanctimonious criticism. They lectured; they postured; they alarmingly claimed we would "double the density," and the Friends newsletter bandied about population projections that said our county population would soar to as much as 57,000, although currently we have only about 16,000 people on approximately 17,000 parcels. Back then, county residents even voted 73.5% in favor of guesthouses, a level of approval equaled only by initial support for the Land Bank. Nevertheless, the Friends maneuvered legally. They sued. They filed with the Growth Mangement Hearings Board. They asked for compliance orders. They won. They rammed the law restricting ADUs/guesthouses down our throats. That law, more than any other law to date, should probably bear the honorary title, "Friends of the San Juans Land Use Prohibition Law." Yes, given her position, I believe it is hypocritical for Vivien Burnet to deliberately violate a land use law. Yes, it is hard for me to believe that the rest of the Friends didn't know about it, especially when they seemed to be very good at surveillance against Charles Dalton. 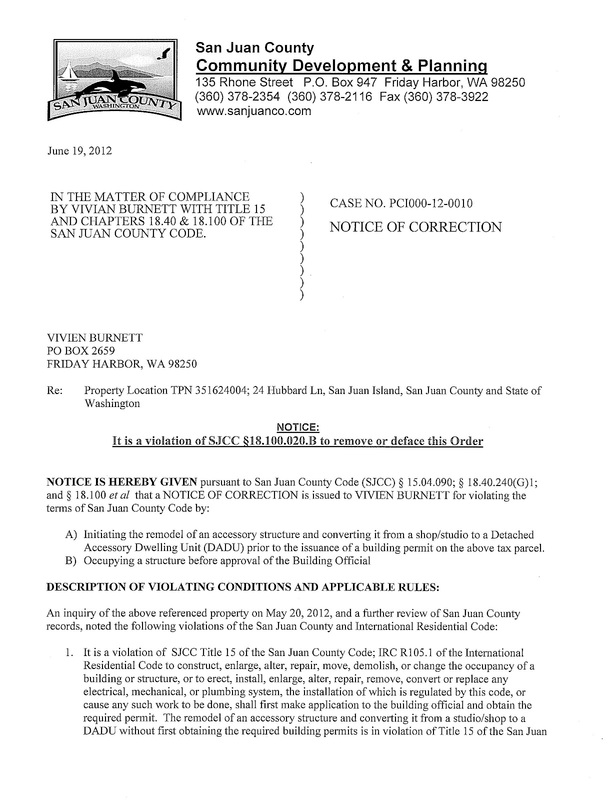 But Vivien Burnett didn't just break any old land use law. She broke THAT law, the ADU/guesthouse law. That takes it way beyond hypocrisy into its own separate realm of Shakespearean duplicity. From my perspective, one of the most politically underrepresented segments of our island society is the voice of old-time islanders. Below is a letter from one of them. In recent months I have been reading, studying, and discussing the issues surrounding the proposed critical area ordinance. My family has deep roots here as my father started the highschool on Lopez and the Clinic is named after my mother. As a native Lopez Islander, I have seen a lot of changes over the years but they have been gradual and mostly positive to allow for moderate and smart growth in our County. In Dr. Adamus’s own words, there are no study results to determine real findings in attempting to control pollution for example. He says that the drivers behind this proposal are “somewhat hypothetical and precautionary”. The actual nitrogen pollutant levels have had some cursory looks by some learned people and appear to be far lower that the minimum threshold viewed as potentially harmful. It is no secret that special interest groups have worked hard to persuade or threaten our officials into adopting legislation that will be far more restrictive than what is required in the “review and revise if necessary” requirement by the GMA. I have also learned that some public “input” has been minimized while some Planning Commission input and County staff input has been of the more restrictive variety based upon individual beliefs in those groups. I have always thought that “we the people” are the ones to whom our elected officials listen to and work for but things have changed. What I see now is a collaborative decision making process using consensus by the governing bodies to make and decide new public policy. This leads me to the emotions of sadness, frustration, and some anger I feel when trying to understand really why such a regulation is being rail roaded through our county government. We the people are about to be required to hand over a bundle of rights (property and civil rights) to our local (and higher) governments. The following is a list of items that were discussed at a meeting of locals (many “old timers”) which cause me concern and I would like feedback for clarification. They may not all be true but I am on a quest for truth at the moment as a citizen and tax payer in San Juan County. Please help me out. 1. 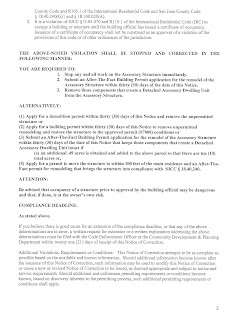 The property owners in SJC are presumed guilty until they prove themselves innocent regarding the issues of the CAO. This is in contrast to Skagit County where the opposite is true, they are presumed innocent of violations unless proven guilty regarding their CAO and their land use. The Skagit County CAO is reportedly much less strict and is pro farming. 2. Dr. Adamus redefined the definition of a wetland which takes us here in SJC from 900 wetlands to 2700 wetlands. To me this is huge when the new wider buffers are added and apparently under the new ordinance, 78% of all tax parcels in SJC are “touched” by the new rules. 3. Under the guise of protecting these newly found wetlands come the list of “thou shalt nots” restricting such things as excavating or tree cutting, with certain caveats. I got a copy of the general portion of the ordinance that was passed in January and tried to make sense of it and see where these items mentioned were found and it was hard to understand because it is more of a legalese type of document rather than one which the common person can comprehend. I understand that there is a more recent version which I took a quick look at and the language was a little more clear but could be simplified, like a FAQ sheet version. 4. I attended meetings off and on over the last few years regarding the CAO and I do remember a county person being in attendance with a pencil in hand and writing some notes. I was told by reputable people that little public meeting input was used in making the final ordinance draft. If true, this should be illegal and certainly unethical. 5. I have a number of friends that make their living from farming here on Lopez. They see this ordinance as the end of a lifelong effort to grow crops and animals for local use. These products have become known as some of the best in the region if not the country. The island used to have over 5000 people on it and was 70% agriculture while the fish runs were at all time highs. Farming is part of our heritage and creates the environment that we hold dear today. 6. Back in the 60s when I was in high school here, we started to get the Californian influx which brought people here that put up fences and posted no trespassing signs. With that influx came some who thought they knew better how things should be run here and began to change things. In more recent years we have seen special interest groups come in here who, in my view, see themselves as the “Saviors” of the Islands and apparently have pushed their agenda with the County officials. The locals see these efforts as a power and control grab which is at the heart of the matter rather than trying to save the environment from the evil hands of the current or future property owners. 7. Perhaps one of the most disturbing things is the way the county expects to enforce the new regulations by encouraging neighbors to spy and turn in their neighbors for any “suspicious” activity. This is similar to how dictatorships have operated historically in seeking out offenders and punishing people. This will change our culture from the tight community that it has been to one where there is always an element of fear and lack of trust present. 8. There was discussion about what it will take to recall the council people who vote for it. I would say that there is a fair chance that a petition to do so may become a reality. 9. Lastly, If this goes through as is, there will be a fair amount of litigation from property owners against the County, especially those with money. The county and us tax payers will be the ones paying to fight ourselves. Also, the passage of the ordinance will be a huge negative economic loss in terms of property values and business losses. A case in point would be if you own a non conforming property under the new ordinance. Who is going to want to pay what that property has been worth with the stigma that the new ordinance will impose in regard to future potential of the property. This will be more pronounced with the Shoreline Management portion upcoming. I would also like to make a comment about the proposed National Conservation Area legislation. I talked with a local woman who recently went to D.C to promote passage of the bill. I encourage you to take a close look at local impact to all our citizens rather than just quickly endorsing this change in ownership. We need to have the bill language published to the local citizens and they be given opportunity to see what is actually in the bill and what impact it will have on them plus what other options are available. We all know that changes to the bill can be made at any time until passage and that could not be what we desire. I see this as a knee jerk attempt to quickly get this through congress politically before a possible administration change takes place. This is not just my opinion but what the local advocate person told me. There also is a multi millionaire adjacent land owner here on Lopez who also may have selfish motives to see this pushed through quickly. My advice is slow it down and let’s have a closer look which is what we deserve rather than a slam dunk. Thank you for allowing me to speak my mind on these subjects and I leave my case with you for fairness and wisdom in decision making. Much of the information, data, and reasoning that comes from the "experts" associated with the CAOs is embarrassingly poor. The emails below from Tom Hruby are about as bad as the letter he and Erik Stockdale co-authored to the Council on February 4, 2011. In that letter, I feel they demonstrated their complete ignorance of environmental risk. Their explanations appeared to confuse environmental risk with Type 1 and Type 2 error. I can only conclude that they have no idea that error, risk, uncertainty, and level of concern are all different concepts. To me, it's astonishing that they have their jobs without having a fundamental grasp of the differences among those concepts, much less be qualified to speak to the merits of statistical papers like Mayer. At some point, the TH will post the Stockdale/Hruby 2011 letter and dismantle its reasoning. For now, have a look at the more recent Hruby missive below. It's hard to know where to begin commentary because it is just so awful, but maybe the best approach is to provide a few overall observations. For Hruby, it seems the nitrogen cycle isn't a cycle. He only acknowledges nitrogen sources, but not denitrification. He doesn't recognize that grasses (including corn) are heavy nitrogen users, and that's why people fertilize grass in the first place, so as to provide the added nitrogen that grasses demand. Anyone who has ever had a compost pile knows that grass is almost pure nitrogen. And I don't know anyone in the islands who is even a moderate user of fertilizers, except perhaps the golf courses. Also, I don't think I've ever seen enough corn on the islands in one spot to qualify as a corn field either. Hruby apparently is afraid of horse poop too, not realizing that the nitrogen in the poop is used by the grasses that get pooped on. The juxtaposition of his "grasses need nitrogen" point with his "manure has nitrogen" point shows no appreciation that the two competing processes might offset one another and be in balance here in the islands. Heck, with the surfeit of unfertilized hay that we grow, I would venture to guess that we might even suffer from general nitrogen deficiency and need more horse manure to be in balance. The more these guys talk, the more it seems like we live in Bushwood Country Club and we're trapped in the movie Caddyshack. Maybe given the leading role of Dr. Adamus, we should refer to it as Addyshack? How long before the experts recommend that we ban Baby Ruth bars? I particularly enjoy how Dr. Hruby cites Europe and Australia when addressing Patty Miller's question about sources specific to San Juan County. I apologize for not forwarding this to you all earlier. I would like to summarize our conversations and my e-mails from yesterday into one to make it easier for you to follow my thoughts. Please dis-regard the e-mails I sent yesterday, especially the first one that had an error in the math. 1. Do the articles referenced in the Mayer paper address the pollutants commonly generated in the dominant land uses of San Juan County? Since most land uses in the non-urban areas do not generate toxic or hazardous materials, the removal of these compounds by the buffer is not a significant issue. 2. Were the amounts of pollutants used to calculate the removal rates in the articles reviewed appropriate for the amounts that might be found coming from the dominant land uses in SJ County? 3. Do we need to have a 75-80% removal of pollutants in the buffer if the amount of pollutants coming in is very low in the first place. Could we get by with a lower % removal because the amount coming through the buffer was so low? 1. Yes, the Mayer article does address pollutants generated by the rural land uses in SJC. The Mayer article reviewed the literature on the removal of nitrogen by buffers. First, when scientists talk about pollution from nitrogen we do not mean nitrogen gas but rather the different nitrogen compounds that act as fertilizers for both terrestrial and aquatic plants. Excessive amounts of "nitrogen" cause eutrophication in wetlands, streams, ponds, and lakes. The BAS report for SJC mentioned that nitrogen removal could be used as a surrogate for the removal other toxic pollutants and I think this is where it became confusing. The major pollutant coming from the rural and agricultural land uses common on the islands is nitrogen in form of fertilizers and ammonia and nitrate in animal wastes. Since the Mayer paper reviewed only the articles on nitrogen removal it is appropriate to use it for SJC. If the lands uses in SJC do not generate toxic materials then we do not have to assume that the removal nitrogen can be used as a surrogate for the removal of toxic pollutants as well. It becomes a moot point. In urban and suburban areas of the county however, it is an issue because of the application of herbicides and pesticides used in gardening and landscaping. I should mention however, that there is one other pollutant coming from rural land uses that can be an issue. This is pathogens (coliform bacteria and viruses) from animal wastes. This is not considered an "toxic" material but it is a pollutant. Pathogens by themselves have little impact on the functions of a wetland, but they do become an issue if the aquatic resource downstream is a source of drinking water or recreation. Buffers can remove pathogens before they reach aquatic resources. 2. Most of the 88 articles used by Meyer to develop his model of nitrogen removal measured nitrogen removal in the field under actual conditions. The studies were done throughout the country and in Europe and Australia. The sources of nitrogen to the buffer zones therefore represent a wide range of different land uses that generate different amounts of nitrogen. Some of the studies were done in forested system where very little nitrogen is released and some were next to pastures and cattle feedlots where the amounts (called the "loading rate") were extremely high. For example, one article (Hubbard and Lowrance 1997) looked at the effect different forest practices had on nitrate removal in buffers while another (Young and others 1980) looked at nitrate removal in buffers where the runoff came from feedlots. For agriculture, corn is one of the most nitrogen demanding crops and it requires about 100lbs of nitrogen per acre per year. Most crops require 50 - 100lbs/acre. Note: nitrogen loading rates are measured as lbs of "atomic" nitrogen per acre. For example there is only 1 lbs of nitrogen in 6 lbs of sodium nitrate, the rest consists of sodium and oxygen. For residential lawns, the recommended amount is about 40-50 lbs nitrogen/acre per year thought most people apply more. I believe that the biggest source of nitrogen in the rural areas of SJC would be livestock of one type or another (horses, cattle, sheep, and even the camel on San Juan Island). The amount of nitrogen coming from livestock in the county can fall within the range found for other land uses. For example, a horse produces 9.1 tons of manure per year (see attached report). Typically a ton of horse manure will contain 11 lbs of nitrogen so one horse will produce 100 lbs of nitrogen per year. If that horse is confined to one acre the "loading rate" for nitrogen is similar to the highest level that is applied in agriculture. If that one horse is pastured on 5 acres the loading rate is still 20lbs/acre/year. 3. The one question I cannot answer is "how much removal is enough?" If a rural land use generate 20lbs of nitrogen per acre per year is it adequate to remove 50% of this in the buffer or do we need to remove 80% to avoid impacts to the water quality in the wetland? None of the articles cited by Mayer address this question and I have not been able to find any published research on this subject. There is much research on eutrophication lakes caused by fertilizers, but none that I have found on eutrophication in wetlands. The decision then becomes one of policy. How much risk we are willing to accept? We can be pretty sure that there will be little risk that the wetland becomes eutrophic if we remove 90 - 100% of the nitrogen going into it. Removing only 80% increases the risk, and this goes even higher if we remove only 50% of the nitrogen coming in. As you mentioned it may be worthwhile exploring buffer regulations based on the density of livestock upslope of the wetland rather than the size of the lot when addressing water quality. We have some very smart, caring citizens in these islands. Here's a letter from one of them. My father bought 5 waterfront acres in West Sound on Orcas Island in 1956. Our family is trying to keep the property going as best as we can. Not sure how much longer we can hold on, due to taxes and yearly upkeep expense. We have turned it into summer rental, but, sadly that is the time our family would like to use it, best time of the year. Other than few storms over the years blowing trees down, nature's way, and a new septic tank, there have been no changes. My father had great respect for his property and we have continued his love and care for the property. The idea of the labels put on property, locations of homes, conforming, non conforming, etc. is very worrisome. Also, I will mention the severity of wetlands regulation since we have many friends on the island who have wetlands running through their property. These people, our long time friends, are turning gray over the stringent regulations. The regulation if a property owner wants to remove a tree that is within a 200 ft. range from shoreline, or plant a garden, he or she will have to get a permit, is another beyond restrictive measure. Also if one wants to open up a shoreline view, restrictions are numerous. I will add buffers, bulkheads and the list goes on. The people who live in the islands are not abusive to their properties. They are proud of what they have bought, have maintained over the years and cared about the beauty of what they purchased. When we drive around the islands, we marvel at how little has changed and are happy people have cared for the islands so well for many, many years. The conceit of the few who ruin it for the many is almost too much to bare. We do not need the Critical Area Ordinance or the Shoreline Restrictions in the San Juan Islands. Do not let the sad scenario of best available science that doesn't even refer to our area, chasing grants and loans, change perceptions of what we are all about and what condition the San Juan Island's are in now and will be for a long time to come. Please do not pull the rug from underneath the old timer property owners and the new comers. We have cared, maintained, put our heart and souls, been proud to live and be part of the San Juan Islands, and lucky as our family has been, to live on Orcas Island. The people of these islands deserve to be left alone, to continue their care of their property and live their lives in a peaceful surrounding without government officials, more rules and regulations breathing down their necks. Nature has its ways in our islands, our eco system and waterways will survive, without the regulations you are about to put upon us. Patty, I hope you will stand out from the crowd and vote no on the upcoming Shoreline and CAO vote. Vote with the majority of the people who have worked hard, who have cared for and loved their properties. Who were thankful they could afford to be in a place like the San Juan Islands. Many whom if one talked with, could tell the experts exactly what takes place in our islands eco-system, how they have watched nature come and go through natural phenomenons, none to the detriment of destroying the islands. As I said before, nature has a way of creating, destroying, and healing in its own time. May your vote free us from what is about to be put upon us ... this I hope, along with so many other great people in the islands, you will truly consider and cast a no vote. Thank you for your time, Patty. I will sign off now, carrying great hope in my heart you will be with us. Here's a sampling of what people are saying about the CAOs based on public records requests. More letters and comments to be posted soon. What's your view? I've been appalled by the public dialogue surrounding this issue...noting it to be high on the hysteria scale and low on the scale of reason. So I attempted to delve into it via the documents that are available on line. Sadly, even though I'm not a novice in reading regulations, these documents flummoxed me. They seem to be nothing more than references and cross references to other regulations, with not an ounce of apparent meaning. I can see why people are confused and willing to listen to individuals who are fearful for their economic well being. It would surely help to promote orderly decision making if someone who is seen as unbiased could lay out the issues in common English, sans code references and gobbledegook, and make it available widely. Not sure this is doable, but maybe worth an attempt? So what is this about having to have some kind of permit from the county prior using a chain saw? Seriously we can't have to travel to Friday Harbor to get some kind of permit if we want to clean up yard debris on our own property? I am hoping this letter to the editor from Dave Durand is incorrect. I cannot believe that you would sign off on something with little or no regard as to what it means to a citizen. You left the island to make your money and then come back here not having to suffer any economic consequences and make decisions with what I see as no consideration for people like us who have stayed here and been a part of this community and are trying to provide jobs for local people. Your actions are endangering our very way of life on this island and you should be ashamed of yourself. I have sat back for years and not said anything hoping that someday the people we elect to represent us will come to their senses and see what they are doing to the hard working business owners and their employees but if what I just read is true I have to say something. If this is true I would like an explanation of your thought process for thinking it is ok to sign off on something like this. You and the other council members tell everyone that if you do not adopt the CAO as proposed by county staff that there are dire consequences to be handed down to the county by the state. I have done some research and am having trouble locating where in the state laws I can find these consequences. Can you please send me the RCW or WAC which explains what will happen if you do not adopt the CAO or adopt only the minimum requirements. You also told Paul Vierthaler that WAC 365-196-050 "Regional and local variations" does not apply to "us". Please explain why it does not apply. Also, you told John you wold get back to him on what if any impact the CAO would have on quarries and mines in the county. He said he has not heard back from you and is asking that your respond to him on this issue as you said you would. Citizens in many parts of the State are having the same troubles that we're having with the CAOs and SMP. For a glimpse at another community, have a look at our neighbors in Kitsap County. There are some terrifically smart, reasonable people in Kitsap County. They should be listened to. The world of County advisory committees is a twilight zone where County staff and appointed public officials merge for the purpose of planning how the rest of us should live. Officially, these committees serve at the pleasure of the Council. They are, after all, County advisory committees. However, some of these committees have a hard time accepting that they have any overlords at all, much less any duty to serve the people. In terms of being insular and detached from the public, perhaps no Committee is worse than the Marine Resources Committee. They feel they are, or should be, some sort of independent governing body. Bear in mind that there is a difference between serving and governing. I don't know who the MRC feels it serves, but they certainly feel they should govern. They have their own website. They have their own letterhead. They make policy. They get grants. They give out grants. They are a world unto themselves. But that's not good enough for them. The email below illustrates the problem. We have a County staffer, Jeff Hanson, telling MRC members that they should have the ability to hire their own staff, even if it means cutting the purse strings to the County. As appealing as cutting the purse strings may be for all involved, it completely ignores the fact that MRC members are appointed public officials who have a duty to serve the public. Honestly, what does Jeff Hanson think the purpose of the MRC is? It shows, I think, where Jeff Hanson's loyalties lie, and it ain't with the people. Somebody ... anybody ... take the MRC, please ... and stop the charade that it is a committee serving the citizens of the San Juans. It isn't. It doesn't. While you're at it, can you find a position for Jeff Hanson and all the other County MRC staffers too? The amount of staff time the MRC eats up with meetings, grants, and pointless insider intrigue is an ocean of wasted taxpayer money. I am writing to you specifically about Question 3 on our agenda with some comments that are implicit in the introduction to the staffing conversation, but I think would not enhance my training relationship with Janice if I brought them up tomorrow. Barbara, Susan Key and I (and to a certain extent Scott Williamson, by conversations with each of us), have been having some detailed conversations about LIO and MRC staffing and project funding, and the ability of each organization to obtain funding to meet their mission and goals. Our talks have been frank, and, of course, from a staff perspective. Between us, we have a variety of expertise on the wide variety of issues involved. Relevant to our discussions tomorrow, I have found myself comparing and contrasting the comparative value to the MRC of in-house part time staffing (Janice Biletnikoff) and a coordinator with the qualities, skill set and local and regional connections we think are important in a coordinator. For the purposes of comparing and contrasting, I have been thinking of Susan as that person, as I think she represents a good potential Coordinator for this purpose. Susan has had experience with the MRC for years, knows its history, goals, mission and many of the details of recent work. Janice does not, yet. Susan has excellent local, regional and statewide connections, and has led cooperative processes locally. She has won grant awards for different organizations and knows key people in state agencies. Janice has not written grants, though she does have some state agency connections through her County planning work. Susan has intimate knowledge about the MSA Monitoring Plan, then County Stormwater monitoring plan, and by virtue of her participation on a newly forming statewide monitoring group, an increasing knowledge of the needs and resources for monitoring at that level. This is specific knowledge that can help tie the MSA plan, the Monitoring plan and potential funding sources together. Also, Susan would have the time, flexibility and a good deal of drive. She, like others we might hire for this, needs the work and would work to see the position expanded. Janice will be strictly limited to 20 hours. Susan is a die hard San Juan Islander, with experience here, and a desire to finish her career, and likely spend the rest of her life, here. Janice is new to this part of the world. Susan represents a potential candidate who has a whole set of skills, experience, drive and desire to take on this work and have the MRC hit the ground running, should she, or someone with a similar set of skills, be hired to take on the work. You've heard this before from me, and I'll say it as long as I have the chance: I think the MRC should seriously consider taking steps that will lead to your ability to address the hiring of your own staff, whether that means working strongly with the County Council or moving to a new fiscal agent. At the Council meeting this past week, it was noted that the redesign of Odlin Park on Lopez will cost more than anticipated. The cost estimate has soared from an initial estimate of $445,000 to $797,500 and the Council approved an additional request for $194,850. The total now stands at $992,350 which, if I am not mistaken, is 223% of the original estimate. 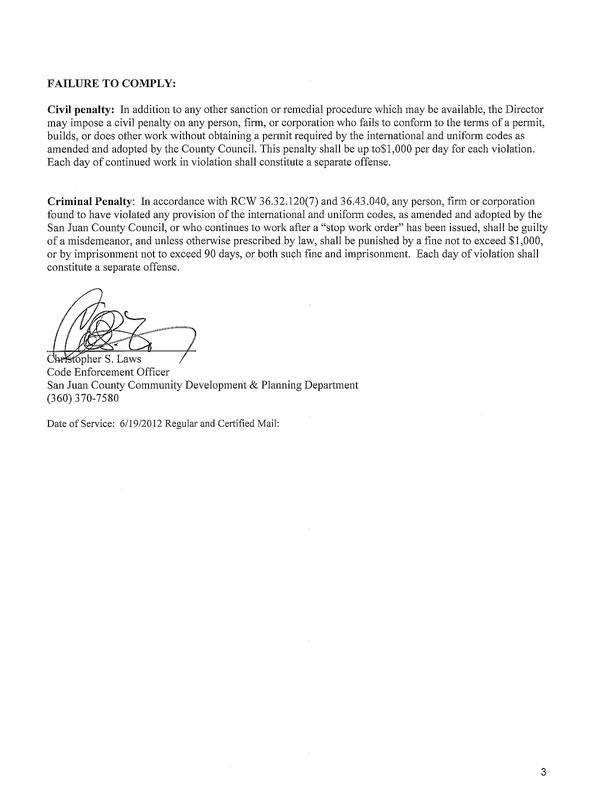 While there are the usual issues associated with the County's seeming inability to run any project on budget, reportedly much of the reason for the higher costs is the greater permitting effort needed to comply with a multitude of regulations. Of course, this is occurring even before the full effect of the CAOs and SMP comes into force. It's also before much of the actual work has begun at Odlin, especially the construction of the new road at the park, which will affect an alleged wetland and require mitigation. My bet is that costs go even higher once dirt starts to fly. Odlin Park illustrates several things. For instance, it is one more example of how the County, once it has made up its mind, will not reverse course no matter what the revised price tag or data say. Think solid waste. The same appears to be happening on the CAO/SMP. Every local project here seems to be a reprise of WPPSS in microcosm. Reminiscent of a Custer decision in Little Big Man, projects aren't re-thought even when projections don't pan out, even if disaster is at hand. The County seems to have a collective ego about its own decisions that prevents it from ever re-evaluating or reversing decisions, much less learn from past mistakes. 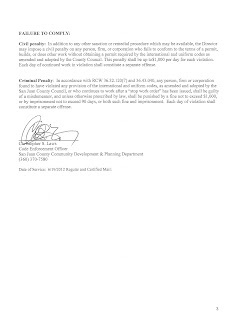 But the main point I want to emphasize is that the Odlin Park fiasco illustrates that the County may not be immune to the costs of its own stricter regulations. After the contemplated CAO/SMP revisions go into effect, everything the County does, or will do, will probably cost more. Even in the unlikely event that the oft-talked-about phantom "millions in lost grants and loans" materialize, it may be eaten up by correspondingly higher costs for mitigation and for enforcement. And the stricter regulations are likely to erode the tax base, so the "millions in grants and loans" will likely have to make up for increased costs as well as decreased revenue from other sources, such as taxes. Odlin is just one example foreshadowing our CAO's Wile E. Coyote relationship with money. We are told we cannot take into account the cost impact of the CAOs on property owners. Yet, the same people who make that declaration chase State money purportedly linked to the CAOs. We can't consider economics, but we have to ram these requirements through because of economics. That only makes sense if, paraphrasing the old Mad Magazine Lone Ranger joke, it depends what you mean by "we" kemosabe. We (property owners) will bear the cost of the CAOs so "we" (the County government) can get millions in grants and loans. Sweet, if you're the government ... or is it? On average, the governments of rural communities already rely more heavily on State funding than urban communities. Whereas State funding in King County may make up less than 10% of the County budget, in rural communities like San Juan County, State funding can comprise 20% or more (sometimes much more) of the County budget. One way to interpret such data is to say that the size of government in rural communities is much more out of whack with the tax base than in urban communities. There is a bigger tax-base funding gap to close. An overly restrictive CAO/SMP won't improve the situation. By shrinking the tax base while adding costs, it increases the tax-base gap and our relative dependence on State funding. This creates a feedback loop which just makes us even more fiscally susceptible to State policy pressure about the CAO/SMP (or other matters). I have a suspicion that buffer widths vary across communities according to the State's ability to apply fiscal pressure rather than environmental risk. A community's adopted buffers probably have more to do with fiscal leverage than functions and values. In the end, rural overreaction on the CAOs and SMP leaves us economically vulnerable and is likely to cause implementation of those ordinances to be economically unsustainable. In high school economics we should have learned that the classic factors of production are land, labor, and capital. The CAO/SMP undercuts those factors of production, especially the use of rural land. With further restrictions, we will accelerate our current trend of an increasingly less diverse economy and a government that must either shrink accordingly or be further subsidized from outside. And, no, tourism (not even eco-tourism) will be enough to pull us out of our decline. The situation at Odlin Park is a harbinger of hard times to come, unless you think we can get grants to cover every cost overrun. Like the planners at WPPSS who projected electricity demand to double every 10 years, we're contemplating outlandishly expensive measures designed for projections that are likely never to occur, except in the minds of our community Custers. The real community massacre won't run its course until after adoption of the revised CAO/SMP, when eventually there won't be nothing left of our community but a greasy spot. At least one legal definition of collusion says it is an agreement between two or more individuals to perpetuate fraud or commit an illegal act. Is that what our Planning Commissioners did on May 25, 2012? Normally, collusion occurs in secret, but apparently the Planning Commission has the chutzpah to engage in potentially illegal "votes" out in the open, during a recorded public meeting. They took a "straw poll" to shut down debate on an important deliberative aspect of the Fish and Wildlife Habitat CAO before even considering the facts. Bias. What this "straw poll" shows is bias. Pure and simple prejudice expressed on the record and for the purpose of cutting off debate and discussion. All shorelines here are critical. If you want to know why, ask one of the Planning Commissioners who voted to shut down debate before it had even begun. The only answer they can give you is "because we said so." All in the interests of "moving forward," as Susan Dehlendorf says. That's a euphemism meaning that you and your rights get run over so they can "move forward." Maybe The Planning Commission Will Approve This Too! 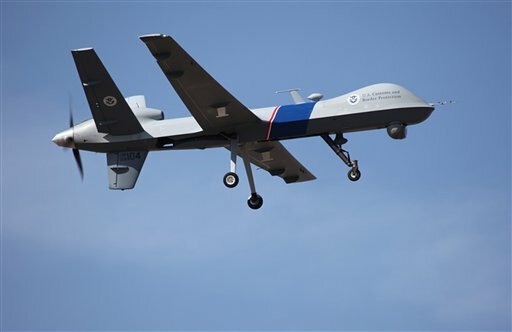 For many months, there has been a link in the sidebar of this blog titled "Coming to a Home Near You" that takes you to an article about the use of drones to conduct domestic surveillance. Little did the Trojan Heron know that such surveillance actually has been conducted by EPA for the past ten years. EPA is using "flyovers" to assess compliance with the Clean Water Act. I wonder how long before the Friends, the Planning Commission, or the Council will endorse those methods here. Maybe there's a grant in it for them. EPA drone that conducts Clean Water Act "flyovers." Back in 2008, the Council designated the entire county as a critical aquifer recharge area (CARA), so there is already a precedent for overreaction here with respect to the CAOs. Although entirely wrong, the CARA did not impose harsh restrictions on landowners, but the Fish & Wildlife Habitat CAO probably will impose severe and pointless burdens. We know from the "straw poll" at the Planning Commission that a majority of Planning Commissioners now want to designate all shorelines and streams as critical. What is at the root of this proclivity for overreaction? It seems like our community panics at the mere thought of human participation in anything. Should we rename the SMP the "Shoreline Madness Plan," or maybe the PSP should stand for "People Spreading Panic." Speaking of the PSP, according to their Action Agenda, after all shorelines have been designated as critical, this scandal-ridden agency then plans to have the government buy a lot of it (see quote from the Action Agenda below). See, we're all part of some agency's grand plan, a bureaucratic fantasy. And for all the citizens who lament the "tragedy of the commons," I have yet to hear an explanation for how putting more and more land into "the commons" solves the purported problem. If it's a tragedy, wouldn't we want to move land out of "the commons?" Spreading hysteria seems to be designed to facilitate the accomplishment of bureaucratic dreams for mission-starved agencies. It sure seems that way anyway. Judging by past events, we're an easy mark here in the northwest. This isn't the first time that folks in the Puget Sound region have gone looney. Hysteria seems to be part of life here. Borrowing Amory Lovins' expression for a new purpose, it causes us to address environmental concerns by "cutting butter with a chainsaw." San Juan Lead Entity Shoreline Protection. San Juan County Lead Entity for Salmon Recovery will identify priority habitats for acquisition by 2013 in updates to the Salmon Recovery strategy, and will lead acquisition of, or establishment of conversation easements for 25% of priority habitat shoreline miles with willing sellers/owners by 2014. Some of you may remember the posts on this blog about the Dalton video, and of course, many of you know that "civility" has been used to try to keep people quiet around here. Below is an email from the Department of Ecology. Is it odd that persons demanding civility post a blog article and anticipate less than civil responses? Could that be because they know the blog article is inflammatory? Just askin’. Makes it seem like the whole public incivility lament has been an orchestrated red herring. Thought you might be interested in a blog article Gordon White posted yesterday evening regarding our role in the Dalton case. I suspect some of the feedback will be less than civil. Below, Dr. Adamus answers some questions. What do you think of them? I find his answers about the Zhang paper particularly interesting. When pressed about statistics at various meetings, Dr. Adamus has declined to answer and has suggested that a statistician should be consulted. But Dr. Adamus' admitted lack of statistical prowess doesn't prevent him from choosing between Mayer and Zhang, which are both statistical studies. How can someone provide expert advice on a topic encompassing their self-professed ignorance? He also gives a statistical answer to the question about the accuracy of the wetlands map. According to Dr. Adamus, the maps have a false positive rate of 3.8% but an unknown false negative rate, implying that it could be quite high. The maps "likely omit" many wetlands, he claims. How many? Only those all-knowing "resident wetland experts" know for sure. 1. Why does upland habitat need to be protected? One scientific reason for protecting upland habitat is that several wetland-dependent species of amphibians and birds require both upland habitats and wetland habitats to complete their life cycle. Under the Growth Management Act, Counties are required to protect wetland functions. One wetland function that is specifically mentioned in official guidance is the provision of habitat -- meaning habitat for all species, not just ones listed as threatened or endangered. 2. Is the forest buffer only necessary to protect conifers? Why do wetland conifers need to be protected, when there are so many conifers in upland (non-wetland) area? No. Forested buffers are needed to protect stands consisting of any type of wetland tree from excessive blowdown. Trees in wetlands need protection even though there are many times more trees in uplands, for the simple reason that wetland trees are more likely to provide essential habitat to animal species that need to live in or very near wetlands. An example is wood duck, a species which prefers to nest in (or as close as possible) to wetlands. Counties are required to protect the habitat functions of wetlands, and wetland trees are a major contributor to a wetland’s habitat functions. 3. How accurate is the “Possible Wetlands” map? “Of 105 [“possible wetland”] sites visited, there were four where no evidence (vegetative, soils, or hydrology) of wetland conditions was found anywhere on the accessible parcel, indicating either a map error or less likely a recent alteration. In other words, the County’s new map of “Possible Wetlands” was determined to have a 3.8% commission error. The rest of the story is that the maps likely omit many wetlands that could not be detected using only aerial photos and LiDAR. This is particularly true of forested wetlands. Resident wetland experts have confirmed this. However, the omission error rate cannot be measured without large expenditures of field time. 4. Why should the Mayer paper be used to size buffers rather than the Zhang paper? The Zhang et al. used less than one-fifth of the full spectrum of 45 buffer studies which they might have, either because they weren't aware of some ("didn't do their homework") or because they purposely avoided using some. Whereas Mayer et al. have ferreted out nearly every nitrate buffer study published up to that point, and objectively included all of them in their analysis. If anything, the Mayer et al. curve is conservative because it includes a few studies of nitrate removal by wetlands; wetlands usually remove nitrate more effectively than upland buffers, although sometimes with detrimental effects to the wetland. Also, at both the "lower and upper ends of the curve" for nitrate, Mayer et al. have more data points than Zhang et al. and thus more credibility to the curve. Most important, the Mayer et al. publication is not only far more inclusive of published studies, it also is more transparent and compliant with standard procedures of academic research and meta-analysis. (2) Doing so would require an enormous expenditure of time and money, and would prove fruitless in some cases because many researchers do not report all those background conditions when they write up their results. 5. With regard to wetlands that don’t have a surface water outlet – if the soils had high conductivity, with good subsurface flow out of the wetland, could they be placed in the Low Water Quality/ Sensitivity category? In theory, probably yes. However, determining if the soils had high connectivity and good subsurface flow out of the wetland (a) would require judgment by a qualified professional who visits the wetland at an appropriate time of year, thus requiring landowners to pay for a consultant, and (b) lacks any basis for deciding what constitutes “high” connectivity and “good” subsurface flow. 6. Jon Cain (legal counsel) would like the definitions of lakeside wetland and large pond wetland refined to be clearer. I will need additional guidance as to what is unclear. “Lakeside wetland” means a wetland that is within or contiguous to and within 100 feet of a ponded water body larger than 20 acres, and whose water levels fluctuate in near synchrony with those of the water body. This does not include wetlands that develop on non-wetland sites, as may occur when water is impounded with a structure. “Large pond wetland” means a wetland that is within or contiguous to and within 100 feet of a body of surface water that is between 5 and 20 acres in size and is present for all or most of a normal year; or a wetland which contains patches of standing water that cover between 5 and 20 acres during all or most of a normal year.